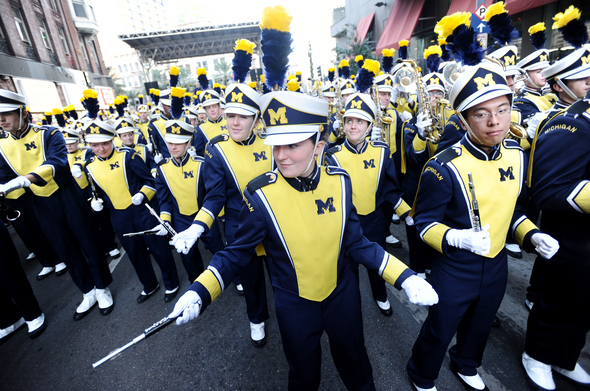 Posted on Thu, Apr 19, 2012 : 6:13 p.m.
Members of the Michigan marching band perform during a pep rally in downtown New Orleans before the Sugar Bowl in January. The band learned Thursday that it will not be performing at the Cowboys Classic when the Michigan football team plays Alabama on Sept. 1. The Michigan football team's marching band will not be making the trip to Texas for the Wolverines' season opener against Alabama. The band was informed of the athletic department's decision Thursday afternoon via email, according to a current member of the marching band. Michigan is set to play Alabama on Sept. 1 in what is being billed as the Cowboys Classic. It will be played at Cowboys Stadium in Arlington, Texas, and is expected to be the nation's preeminent opening-weekend game. Michigan spokesman Dave Ablauf said the Wolverines are treating the event as a typical road game in this matter, though, because of the cost associated with the 1,200-mile trip. "We are treating the Cowboys Classic game against Alabama as any other road game," Ablauf wrote in an email. "We do not have a travel allowance for the band like we would for a bowl game. "They traditionally travel to conference games and our rivalry game against Notre Dame. We have not taken our band on similar trips in the past." Michigan will be paid $4.7 million for appearing in the game. In its contract for the matchup, it was guaranteed seating for the band. The Crimson Tide's band is scheduled to attend the game. There was a negative backlash on Twitter after the Michigan Daily reported the decision. The band also is unhappy about the move, with several email strands started between sections that call for members to voice their displeasure. However, band members are being told not to comment publicly on the matter. "We are writing to express our strong opposition to the Athletic Department’s decision not to take the Michigan Marching Band to the Michigan-Alabama game in Dallas. It is our understanding that Michigan will be paid 4.5 million dollars to participate in this game, and the athletic department is unwilling to fund the band’s participation. The Michigan Marching Band members work tirelessly for the entire season, spending comparable hours in practice to the football team (or any athletic team), in preparation for each show. Each week the band high steps into the stadium results in the eruption of thunderous cheering and applause from the home crowd. They play on almost every down throughout the game, helping to keep the fans involved. They add an integral component to the tailgate, pre-game, and half-time activities which would be sorely missed in a huge event such as this. Alabama is bringing their band, and we would look pathetic by leaving ours at home. In the words of Brady Hoke, “This is Michigan for God's sake!” Tickets and non-refundable travel arrangements have already been purchased by tens of thousands of Michigan fans, who will be expecting to see the full Michigan game day experience. Please take the Band!" Wed, May 23, 2012 : 3:54 p.m.
A VERY SAD DAY FOR FAN LOYALITY. Seems like loyality to the school is now far down the list of what is really important to the administration and athletic department. &quot;Money&quot; has now taken over the first 10 places in that list. How better could Brandon and Coleman have offended members of the band, ticket holders for that game, and all those people who support the &quot;image&quot; of the University of Michigan. It would be very interesting to see if The Athletic Department has actually already sold those seats reserved for the Band. If Dave Brandon and Mary Sue Coleman are the main people behind this decision, I hope that those who object to this decision to not send the band, show strong negative reaction to those individuals. Wed, May 23, 2012 : 3:06 p.m. I can not believe that the band is not going to the game! I echo what everyone else is saying that this is an embarrassing and huge omission to not have the band playing at half time. Out of almost 5 million bucks, I am sure this should cover the cost (since the money was a huge reason to have the game for Alabama and U of M) and leave quite a good profit besides. Please reconsider!!! Wed, May 23, 2012 : 4 p.m.
Sun, Apr 22, 2012 : 11:09 p.m.
Dave, I understand you want to make the football team relevant again on the national stage. I know we don't have a winning record in the Rose Bowl since 1969 and I realize this all takes money however, the band helps make the whole thing exciting. Took a friend to the Holiday Bowl in 94 or 95 a real boring game with Colorado State. I'll tell you that at half time and the end of the game that place was rocking with the sounds and sights of the Michigan Marching Band. Sun, Apr 22, 2012 : 7 p.m.
Gimme some cheese with that WHINE! Band parents...pay to send your kids! Sun, Apr 22, 2012 : 1:18 p.m.
Sun, Apr 22, 2012 : 1:20 a.m.
Long time season ticket holder, bought tickets for the 'bama game...and could care less if the marching band is there or not. I'm going to watch a FOOTBALL GAME. Based on these comments its more apparent than ever why I'm constantly being told to sit down at the stadium...you all aren't there for the actual game! Sat, Apr 21, 2012 : 3:10 p.m.
No travel budget for the &quot;students&quot; in the Michigan Band....then there should not be enough dollars in the budget for the &quot;student&quot; cheerleaders, dance team members and not to mention the athletic department entourage. Silly me I thought college was about the &quot;students&quot;! Sat, Apr 21, 2012 : 1:44 p.m.
Reading some of the comments here, one would think the game itself is only a secondary concern. I think Brandon's &quot;big picture&quot; is spending the $400K on something that helps the athletic department increase the stature and competitiveness of its entire athletic portfolio. Go Blue! Fri, Apr 20, 2012 : 9:56 p.m. The team, the team, the band ! Fri, Apr 20, 2012 : 9:53 p.m.
Mr. Brandon: A reprehensible, classless, financially stupid, cynical decision. Almost as classless as when Michigan refurbished the stadium without following the law on adequate facilities for the handicapped and had to be sued into following the law. Shame on you Mr. Brandon. A week after giving Borges a $300,000 raise- we see were your heart lies. Fri, Apr 20, 2012 : 8:39 p.m.
Fri, Apr 20, 2012 : 7:57 p.m.
Out of the 26 million in profit that the athletic department cleared, in this non profit institution, hahaha, they can't find enough money to cover the cost of the band traveling to the season opener with Alabama? Something is very wrong with this picture. Hey Brandon, get your priorities in order on this one. Send the band to Dallas. Fri, Apr 20, 2012 : 7:40 p.m.
Hey Dave, can't you get a break on Domino's pizza and just feed them pizza for a day or two. Or how about putting out an address and asking for donations from Mich. faithful. I for one would send what I could afford. Dave, you overpaid Brady and staff and that's fine cause I understand what your trying to create here but the band is a large part of the whole Enchilada. Fri, Apr 20, 2012 : 7:38 p.m.
Fri, Apr 20, 2012 : 7:14 p.m.
For all of the talk Brandon has said about being a Michigan man and restoring traditions that were destroyed by Rich Rod and now he pulls this! The band should go to the game and should never have been up for discussion to not take them. Greed is what runs through him and anyone else who said yes to not taking the band. No to the band but yes to the bank...is the motto of the day at the Michigan Athletic Department. Fri, Apr 20, 2012 : 7:07 p.m.
on the othre hand, since UofM has the 250 or so tickets set aside for the band in a really good section in the lower bowl, I'm betting that they'll sell those tickets for what, maybe $500 each? That way, DB has taken a $400,000 expense and turned it into a $125,000 profit! ...and that's how we make the pizza!!!! Fri, Apr 20, 2012 : 7:04 p.m.
Jeepers, put 'em on greyhound buses, let 'em ride on Amtrak, have 'em carpool.........doesn't matter, just get them down there. Or, maybe we should just pipe in &quot;sweet caroline&quot; sometime in the third period after we do the wave? Fri, Apr 20, 2012 : 6:18 p.m.
Michigan football gets paid to play games? How much do the players get? Seems like UofM is pimping out their players...feels a bit slimy. Every school makes money on games. The players get a full ride at a top notch school. As someone who is paying for their college, I would play football in front of thousands (millions on tv) for a free education. Fri, Apr 20, 2012 : 5:55 p.m.
&quot;Tickets and non-refundable travel arrangements have already been purchased by tens of thousands of Michigan fans, who will be expecting to see the full Michigan game day experience. Please take the Band!&quot;&quot; OK, quick show of hands, who would not have bought a ticket to this game had they known the band was not showing up? That's what I thought. Fri, Apr 20, 2012 : 6:16 p.m.
Fri, Apr 20, 2012 : 5:47 p.m.
One of the benefits of playing a football game in Texas is that it can improve Michigan's football recruiting effort in that state. I am sure that seeing and hearing Michigan's great marching band perform only enhances the effort to interest top football and basketball recruits. In addition, Texas high school students who play in band may be impressed enough to consider attending Michigan for their college educations. The more applications received by Michigan the better the quality of next year's entry class. Fri, Apr 20, 2012 : 5:10 p.m. I can see this being an unpopular decision, and personally I'd really prefer to see them go. That said, don't try using the argument &quot;well we're getting $4.5 million, I can't believe we can't afford to bring the band&quot;. That money is already allocated, folks. Our football and basketball programs basically fund the rest of our athletics. If you want to argue the money is better spent on bringing the band to Dallas vs. supporting the women's field hockey team (or anything else in the budget), be my guest. But we have to consider ourselves lucky: Michigan is one of the few universities in the country whose athletic department manages to pay for itself. Fri, Apr 20, 2012 : 8 p.m. The Athletic Dept cleared 26 million last year. Use some of that money for the band. Fri, Apr 20, 2012 : 6:40 p.m.
You raise an interesting point. The SEC sponsors about half the athletic programs as the B1G schools. This may tell you why 'Bama can send a band somewhere without any funding concerns. Fri, Apr 20, 2012 : 4:54 p.m. Honestly people! I am as big a UM band fan as anyone, but how often do they show the band on TV during the game? Hardly ever! And they don't televise the half-time show. Hopefully this decision won' t turn into a trend. Fri, Apr 20, 2012 : 5:16 p.m.
Fri, Apr 20, 2012 : 4:31 p.m.
Fri, Apr 20, 2012 : 4:22 p.m.
All school bands from high school through college spend as much time, and probably more, working and practicing to support the teams. They do it almost anonymously, without the fanfare and praise that's heaped upon athletes, yet they are a major force in building school spirit and fan base. And a band exmplifies the spirit of teamwork, as any drum major can tell you. To have a major school pinch pennies and not allow the band to travel to a key event is a travesty, and the decision needs to be reversed. Fri, Apr 20, 2012 : 7:56 p.m.
Fri, Apr 20, 2012 : 4:20 p.m.
Poor job and timing by the University. As said on WTKA this morning, here's your increase in cost for season tickets for Football and Basketball, oh also you must renew on line. You want to be on a waiting list for tickets? Well open that pocket book. U of M getting paid almost like a home game so treat it that way. Finally what happens to the tickets allocated for the band already?? I am sure Mr Brandon has idea's for that as well. Fri, Apr 20, 2012 : 3:42 p.m. This BS smells a lot like CEO/DB Can you say HORRIBLE? Guess a rung in the ladder to once again being a legit national program is broken. HORRIBLE! Fri, Apr 20, 2012 : 3:19 p.m.
Fri, Apr 20, 2012 : 3:15 p.m.
Less than one week after @DaveBrandonAD RT Mitch Albom's article on UM Glee Club (http://t.co/lzIRxRTS), DB makes this decision. He obviously sees the value in the college experience as a whole, but don't ask him to foot the bill. Policies are guidelines - not end all, be all. Not all decisions are meant to be made by it's affect on the bottom line. Very disappointing. Here's hoping Jerry Jones is willing to play &quot;A Saturday Tradition&quot; over the sound system. Fri, Apr 20, 2012 : 3:11 p.m.
What is this &quot;crap&quot; --&quot;However, band members are being told not to comment publicly on the matter.&quot; no Freedom of speech????? and at an academic institution. This alone makes one wonder what is going on and to what extent. Are we &quot;in violation&quot; too because we dare to write about this policy here? Fri, Apr 20, 2012 : 3:03 p.m. This has got to be some sort of marketing/ PR stunt. I'll bet the band makes it at the last minute, somehow, thus creating a great story to be told during the game. Otherwise, it seems like a stupid move that Brandon, a marketing guy, wouldn't normally make. Fri, Apr 20, 2012 : 3:16 p.m.
A U of M prof noted many years ago that any publicity is good. If this is really that kind of a stunt it is way beneath a standard the U of M has or should have. Short-sighted, stupid, petty, and a waste of a great opportunity. I guess that about covers it. I say this as a U of M alumnus and presidents' club member. Fri, Apr 20, 2012 : 6:15 p.m.
&quot;Short-sighted, stupid, petty, and a waste of a great opportunity.&quot; that can be said about Brandon's entire tenure. Fri, Apr 20, 2012 : 2:47 p.m.
UM is getting crushed on national and local talk shows today! Alabama fans are in disbelief. Neutral fans are mocking us and talk show hosts are saying &quot;are you kidding me Michigan?&quot; You are getting a 4.7 million dollar payday for the Cowboy Classic, you just got a large BCS payout from the Sugar Bowl, and donations are up 12%! What a horrible decision! Change your minds now UM brass! This is embarassing! Fri, Apr 20, 2012 : 2:45 p.m.
Just a few quick observations from a U-M Marching Band Alum Class '78: The 2012 Academic Calendar does not begin until Sept. 3rd, two days after the game. The MMB will be holding a &quot;band camp&quot; in the 2 weeks prior (presumably) but the auditions/tryouts and final placements won't be ready until the classes are in session. This means the marching band will not be in &quot;top form&quot; and it may be too much to ask to have people come to campus early just to put together a national show. I myself was working right up until school started and this will be true for several others planning on attending Michigan next Fall. I am sympathetic with the reaction to a negative decision, true, but the logistics are as much a factor as the $400,000. This is a tough decision to make for anybody, even a &quot;Michigan Man&quot; who deserves not to be roasted like this. I believe there will be an appearance by some group representing our great Band, regardless. YUBA!! Fri, Apr 20, 2012 : 3:21 p.m. These are NOT the reasons it was decided the Band would not go. It was MONEY. I would bet there are enough Band Members that would be available to make the trip and put on a great show. Fri, Apr 20, 2012 : 2:40 p.m.
Fri, Apr 20, 2012 : 9:11 p.m.
Like that's going to happen against Bama. Look for 45-0 at halftime, final score 59-3. Fri, Apr 20, 2012 : 2:30 p.m.
What a horrible decision! And it is incredibly poorly times since it came on the heels of a survey sent out to Victors Club members asking about how they feel about their donations and what their motivations were. My torches and pitchforks are ready; who is organizing the protest? Fri, Apr 20, 2012 : 3:05 p.m.
Fri, Apr 20, 2012 : 2:31 p.m.
Fri, Apr 20, 2012 : 2:22 p.m. Anyone who can't figure out how to get 350 people (assuming the entire band went) and their tubas to Dallas for less than $400K is either a complete idiot or isn't trying very hard. Regardless of the cost, the person who made this decision made it very obvious he/she doesn't get it and doesn't care to get it. Fri, Apr 20, 2012 : 2:03 p.m.
As I recall from the seating diagram, there was an actual place for the band to be located within the stands. Having sold out its allotment of tickets, it would not surprise me to learn that the Athletic Department turned around and sold those seats as well when sales were brisk (perhaps even more brisk than expected). Should this be the case, expect no reversal and no remorse from the Brandon crew, no matter what the public outcry and outrage is. Sat, Apr 21, 2012 : 4:49 a.m. Very smart. Now I understand. Now if the alumni just make Brandon and the M pay for this decision in spades. Coleman and Brandon are employees- beholden to the regents, beholden to the alumni, beholden to the taxpayers of the state of Michigan. Fri, Apr 20, 2012 : 3:28 p.m. If this would indeed be the case for the decision then there needs to be a replacement made of the one that made that decision. It would prove money trumps ALL other values in the athletic department. Fri, Apr 20, 2012 : 3:20 p.m.
that's precisely what happened. It was a shameful money grab, and nothing else. Fri, Apr 20, 2012 : 1:53 p.m. I can't believe they wouldn't make accommodations for the band for this historic game! Sad. Baaaand take the fieild! Come on Michigan, we are traveling to see the Michigan football experience...we travel and pay so you get these invites, now you can pay to deliver the experience we would get at good old Michigan Stadium. Please reconsider! Fri, Apr 20, 2012 : 1:49 p.m. I guess my donations are going to the wrong place. Instead of the football program getting 100% I will now split them with the band. They are a huge part of my game day experience! Fri, Apr 20, 2012 : 7:51 p.m.
Fri, Apr 20, 2012 : 4:56 p.m.
Fri, Apr 20, 2012 : 2:08 p.m.
Fri, Apr 20, 2012 : 1:36 p.m.
Fri, Apr 20, 2012 : 1:34 p.m. The band and &quot;The Victors&quot; is a part of the &quot;Block M&quot; and football brand Mr Brandon! Please reconsider! Fri, Apr 20, 2012 : 1:31 p.m. I can't imagine how the band costs $400,000 to attend the game. I found a Michigan Daily article that said there are 275 members in the halftime show. So that's $1,454.55 per member to attend the game if they all go. Options they should consider are: 1) Bus down on Thursday night, arriving Friday, and back again on Saturday, using 1 night hotel. 2) Take a smaller than full contingent IF that wouldn't impact the appearance against Alabama. Maybe they're bringing less than a full contingent. Fri, Apr 20, 2012 : 1:30 p.m.
OK, just to be clear, the policy is that the band does not travel for raod games, sans select conference games and Notre Dame (which is a quick bus ride) - correct? if this game was held at Alabama, there would be no issue BUT the game is in Texas and is being treated as a de facto pre-season bowl game (bad idea, by the way, to over emphasize this game at the cost of others) people are complaining the band is not going? Money, scmoney, there is a policy in place and this is about the ego of the band wanting to be included in this, nothing more. Sat, Apr 21, 2012 : 4:42 a.m. There is no policy that covers this scenario. The tickets are priced as a bowl game, the game will be all over the nation, the payout is huge- like a good bowl game. Alabama is bringing their band. It is a disrespectful, classless, valueless decision that Brandon made. But even from a business standpoint it is stupid. Michigan will lose much more in alumni donations, lose of fan loyalty (brand loyalty for the corporate pin heads) and maybe even loss of the game. Fri, Apr 20, 2012 : 4:55 p.m.
Just to be clear... which ego are we talking about? The Mich Band's or Brandon's??? Fri, Apr 20, 2012 : 1:28 p.m.
Let our voices be heard - get on Twitter, and use the hashtag @MMBtoDallas, and make sure to put @DaveBrandonAD in the tweet. Don't let them turn this into a fund-raising drive, Athletic Department needs to fund this. Fri, Apr 20, 2012 : 1:21 p.m. I guess $4.7 million dollars doesn't leave much funding to put the band on a bus. So how much would those buses actually cost? They're &quot;just&quot; the band, so they could be red-eyed down and back with no hotel. Shameful. Fri, Apr 20, 2012 : 12:44 p.m.
Dave brandon would sell his soul if it brought him a little more profit. Fri, Apr 20, 2012 : 2:26 p.m.
No, he'd sell YOUR soul. His has been gone for some time. Fri, Apr 20, 2012 : 12:31 p.m.
Dave Brandon showing once again that he cares nothing for what makes Michigan Football the power that it is. He is no better than Jerry Jones. Fri, Apr 20, 2012 : 12:18 p.m.
Is josh groban available? If not, is rich rod? Fri, Apr 20, 2012 : 12:11 p.m.
WHAT? I'm a spartan but this is ridiculous! Fri, Apr 20, 2012 : 12:04 p.m. This is truly sad. Do the right thing, Mr. Brandon, reverse the bad decision and take the band. This shouldn't even be a discussion. Fri, Apr 20, 2012 : 11:49 a.m. I'm sure Ufer is shaking his head right now. Shame on Brandon for being penny wise and tradition foolish. You start to get the sense Brandon would sell baby kittens to shampoo testers if there was a nickel in it. This ain't pizza Dave and the &quot;brand&quot; you're messing with now is much bigger than the one you came from. Wise up, send the band and start thinking about the drum line and not the bottom line. he constantly talks about &quot;brand management&quot; but he clearly lacks an understanding of what the Michigan brand is. Fri, Apr 20, 2012 : 11:41 a.m. Overwhelming criticsm on the local radio station this morning. I applaud the activism and support all of the criticsm toward the Athletic Department. Lots of very good points and comment were made. This is about the Michigan brand. Band members start practicing for the first home game wel before Labor Day. I am sure a reversal in this decision will be forth coming soon. Fri, Apr 20, 2012 : 11:36 a.m.
Just another &quot;typical road game&quot;???? I don't think so. The huge national TV audience and major bowl game ticket prices say otherwise. The stakes are higher and Michigan NEEDS the band there. Simple as that. Mr. Brandon: you blew it with this decision. But there's still plenty of time to correct this huge mistake. In this case, money should not govern the decision. Michigan has plenty of it, so stop being so cheap! Fri, Apr 20, 2012 : 10:13 a.m.
Brandon and Coleman poor mouthing U of M can't afford it...incredible. Fri, Apr 20, 2012 : 5:52 a.m.
Wow! This is shameful. So are we just sending the team there for a payday or are we going there to WIN the damn game? Send the band too and MUSTER ALL THE SUPPORT WE CAN FOR THIS TEAM. This must be fixed. Fri, Apr 20, 2012 : 5:50 a.m.
Decision under review. Bad call by &quot;someone&quot;. On the field ruling reversed. Band to be in Dallas! How could it be any other way Mr.Brandon? For God's sake this is Michigan! First class program demands first class band to join first class coaches and team. This is a bowl game venue, not just another road game! Ticket prices raised,coaches salaries raised, game payout raised, but no money for the finest marching band to play the greatest fight song on a national stage. A blown call. Let's get it right! GO BLUE!! Fri, Apr 20, 2012 : 5 a.m.
Next will be a decision to put a halo around Michigan Stadium. Just send the band. Everybody wants them there. Go Blue! Fri, Apr 20, 2012 : 3:40 a.m.
What exactly is included in the ridiculously high ticket prices? Brandon, you wouldn't deliver a pizza without the domino's would you? Fri, Apr 20, 2012 : 3:28 a.m.
40 comments and all oppose this decision. Dave did it again. His ego is big, that actually thinks he can make a decision like this. Get over yourself Davey boy. The band will be there and you will have mud on your face. The Alumni will not stand for it. And if they dont get to go, I hope they send a clear message during the first home game. March in backwards, and not playing the victors. Fri, Apr 20, 2012 : 3:08 a.m.
really bad decision - the tickets cost just as much as a bcs bowl and i am sure fans would love to hear the band. this is public exposure and a big to-do is being made out of this game - fund the band. i think brandon did just formed a major pr buff. maybe they can share in the costs of folks donate money the trip. Fri, Apr 20, 2012 : 3:02 a.m. The band should be there. Period. Fri, Apr 20, 2012 : 2:45 a.m. Really!! They won't spend 10% of their profit to bring the band to Cowboy Stadium. Really!! 'Bama's bringing their band. We're going to be sitting there with NO band!! This is not 'any other road game'. I'm sure they're spending more than $400K to bring 'administrators/staff' to the game. Would they all be going to 'any other road game'? Leave them at home and bring the Band! You should have told us before we bought tickets to the game! How short sighted! A 30 sec ad for the game costs more than $400K, and every time the band plays 'The Victors', it's worth more PR than the 30 sec spot they give each school at half time! Really!! Fri, Apr 20, 2012 : 2:31 a.m. It appears the Band has been getting marginalized the last couple of years with implementation of the &quot;pro game&quot; mentality at football games (a lot more recorded music). Is this a next step? Fri, Apr 20, 2012 : 2:28 a.m.
Fri, Apr 20, 2012 : 8:03 p.m.
Mr Pizza Man is all about money, folks. He comes from corporate America and that is his priority. It doesn't matter what he says otherwise. This is a ploy to get alumni to chip in. There is plenty of money to send the band to Dallas. Maybe it's time for Mr Pizza Man to go back to his pizza empire. Fri, Apr 20, 2012 : 4:28 p.m.
81wolverine - I'd like to think that, too. But time and time again DB has proven that he's about one thing: making money. And for someone who has been preaching the Michigan &quot;brand&quot; since day 1 on the job, this move makes zero logical sense... hence my suspsicion that this is all calculated. Proof of that will come when we see the band on the Jerry World field on Sept 1. Fri, Apr 20, 2012 : 11:31 a.m.
You might be right, but I hope not. Because it would be shameful for Brandon to play that kind of game to fund an expense like this. He and Michigan should be above that kind of ploy. Fri, Apr 20, 2012 : 2:24 a.m. The ticket price is so high it is laughable. I paid it anyway assuming this was to be an all out, once in a lifetime experience. Well you have jipped me and all the other UM fans that bought tickets. You seem to think this is some sort of &quot;gift&quot; to the band. It is not, it is part of the experience that I as a ticket holder paid for. Fri, Apr 20, 2012 : 2:23 a.m.
Oh yeah, you could all stand up and do an A capella rendition of &quot;Sweet Caroline&quot;. I think Brandon would get so excited he would pee his pants. now that's a Michigan Man. Fri, Apr 20, 2012 : 3:06 a.m.
Well whats an Ohio man then? Hopefully Tressel wasn't it for obvious reasons..... Or maybe Urban? Ya know, once things get tough just bail and go on vacation. He couldn't handle florida, wait until he is forced to spend extended time in Ohio... I'd want to leave too. Fri, Apr 20, 2012 : 2:22 a.m.
Brandon screwed up here, big time. I'm embarrassed to be a graduate of the University of Michigan. Dumb. Stupid. Moronic. And ANGRY! Fri, Apr 20, 2012 : 2:19 a.m. This has to go down as the athletic department's dumbest decision since mid December 2007. My smart money (don't grab it David Brandon) is that the decision will be reversed in the coming days. It is beyond any of us how such an obvious decision could have been made. This is the big stage that Brandon claimed he wanted, but then he sullies it by denying the band members the right to go, and denying the families and fans the chance to see the band? Get a clue David Brandon and Mary Sue coleman. Just how important are the student's involvement at the U of M? A couple of days ago a student was denied a chance to speak on a technicality at a Regents meeting ( Mary Sue Coleman was there) ...and now the Band Students cannot go to a MAJOR game because of &quot;too high&quot; a cost that has been question by many. Fri, Apr 20, 2012 : 2:17 a.m. Instead of the band, at half time all you Michigan Men could stand up and jingle your keys. That will really scare bama. That's it? That's the best you got? If only the band would learn to play Hang on Sloopy or if UM had a mascot with a big ol' nut on his head, I'm sure that would give Michigan the edge. Fri, Apr 20, 2012 : 2:05 a.m. The full band? Forget it. The 2012 band doesn't exist. It comes to life the two weeks before school starts, and the game is a week before school starts. Beyond the $, it would be a logistical nightmare to get everything in place to field the band that fans are accustomed to seeing for a September 1 game. Also, other than bus trips to EL, South Bend and Columbus and the subsidized bowls, then band, in fact, rarely travels. All that said, if I were Brandon, I'd sure as heck figure out how to put a decent-sized pep band in the stands! Fri, Apr 20, 2012 : 5:52 p.m.
Fri, Apr 20, 2012 : 4:24 p.m. The band has a fully-prepared show ready to go for the first game every year. Sometimes that even happens before September 1. Just because it might be difficult doesn't mean not to do it. Fri, Apr 20, 2012 : 2:58 a.m. According to the contract between Cowboys Stadium and Michigan (Section 3), Cowboys Stadium will provide &quot;seating for the Team's band.&quot; http://www.annarbor.com/2011/10/04/2012%20College%20Football%20Agreement.pdf Why put it in the contract if they weren't planning on them being there and just randomly announce it today that they're not going? Nice end of the semester going away gift the MMB students got. Sure that just made their summer! Nice job by Brandon to act like the athletic department is broke and beg for donors to pony up to pay for the band's trip. Fri, Apr 20, 2012 : 2:46 a.m.
We don't go to EL this year. Fri, Apr 20, 2012 : 2:03 a.m.
Ok, lemme get this straight: A school with an endowment of $7.8 billion is unable to dish out $400K so an intrical part of Michigan's game day experience can be present at what measures up to be a preseason bowl game??? Unfathomable. Fri, Apr 20, 2012 : 2:01 a.m.
Fri, Apr 20, 2012 : 1:54 a.m. Huge stage and not merely another road game; send our band! Fri, Apr 20, 2012 : 1:50 a.m.
Fri, Apr 20, 2012 : 9:16 p.m. I love the band too but couldn't score tickets to the game. If the band doesn't go feel free to send the tickets to me, I would still attend!! Fri, Apr 20, 2012 : 8:40 p.m. I guess without knowing me, I don't know why? Fri, Apr 20, 2012 : 6:10 p.m.
You have tickets but are now second guessing. Why do I find that hard to believe? Fri, Apr 20, 2012 : 1:44 a.m. I'm a die-hard Spartan living in the home of the Wolverines and even tho I root for 'anyone but Michigan' even I think it's insane that the band isn't going to the opener. Schools make so much damn money off football and basketball and they want to pour it into the pockets of administrators or renovating stadiums to pay for luxury suites. Sure, those alums will buy those and I bet they want to see their marching band at away games too! Cheapskate administrators. Agreed. If I never heard the michigan marching band play a single note again, I would die happy, but not sending them to a game like this is just plain stupid. It seems they've forgotten what college football is all about. Fri, Apr 20, 2012 : 1:43 a.m. There is only one thing better than Michigan scoring a touchdown, and that is turning up the volume on the TV and listening to Hail To The Victors so loud that pictures fall off the walls! Common' Michigan, you can do better than that!!!!! Fri, Apr 20, 2012 : 1:42 a.m.
Fri, Apr 20, 2012 : 12:58 a.m. Typical CEO move. Brandon is on several board of directors and this is very typical of their behavior. Companies pay their execs through the rough but must cut back on the working men and women of the company. Front line supervision takes the biggest hit. Brandon is making money with the department but of course it is not enough. Just like this year he raised the ticket prices ANOTHER $5 and yet called it modest. Last year a season was just $5 short of a grand for a pair without any seat license. One of the most profitable universities in the country but we need to raise prices and oh by the way we are not bringing the band it is too costly to our greedy bottom line. Fri, Apr 20, 2012 : 1:47 a.m.
No, a good CEO knows his brand. As others have stated above, this is either a dumb move or a move to have alumni foot the bill for the band. When I think Michigan football i think winged helmets and the marching band playing the victors &quot;We have not taken our band on similar trips in the past.&quot; Seriously, when was the last time Michigan played football without their band? Fri, Apr 20, 2012 : 4:12 p.m.
Fri, Apr 20, 2012 : 2:10 p.m. The only away games they go to are MSU, OSU and Notre Dame (other than bowl games). Fri, Apr 20, 2012 : 12:57 a.m.
David Brandon told The Detroit News that it would cost $400K to send the band to Dallas, &quot;but the cost is beyond what we can afford.&quot; According to AnnArbor.com, the athletic department turned a $4.7 million PROFIT in 2011 and was expecting over $11 million in PROFIT for 2012. http://www.annarbor.com/sports/michigan-board-of-regents-meeting-athletic-department-budget-dave-brandon-university-of-michigan-job/ Yet $400,000 is beyond what they can afford? Who are you kidding, Mr. Brandon? Fri, Apr 20, 2012 : 4:30 p.m. Spending nearly 10% of the years profits for one trip does seem awfully extravagant. The expectations for 2012 are just that - expectations. While I would love to see the band travel with the team, I don't think that it is quite so simple as it is being painted here. Fri, Apr 20, 2012 : 3:31 a.m.
All of us, it seems. Fri, Apr 20, 2012 : 12:55 a.m.
Fri, Apr 20, 2012 : 12:51 a.m. It would be illuminating if the reporter could outline the specific costs associated with transporting and housing the band to a similar type bowl game so us readers could gauge how much money it would actually cost or save. Fri, Apr 20, 2012 : 12:21 a.m.
U of M for sale. Who cares? Imagine if the band turned their backs on the team?! Fri, Apr 20, 2012 : 9:07 p.m.
Like anyone goes to see the band. Fri, Apr 20, 2012 : 12:14 a.m. It just seems downright cheap. They could send the whole band for 1/3 of Borgess' raise for this year alone. We want to be elite like 'Bama, then we send our band like 'Bama. Get 'er done, Brandon. Fri, Apr 20, 2012 : 12:06 a.m.
You have one of the most adored bands in college football, with THE BEST fight song in the nation, and the payday for this game is over $4 mil against the defending National Champion..... yet, we're not taking our band.... I don't expect Mary Sue Coleman to do anything about this because she has been worthless since the day she stepped foot on campus. However, I'm a little surprised that Brandon would take this route. I hope to God that Coach Hoke, the alumni, and fans voice their disapproval of this terrible decision in mass quantities. Hopefully, this decision will be overturned. Fri, Apr 20, 2012 : 12:02 a.m.
What an embarrassment! This is absolutely ridiculous. The difference in the road games televised without the Michigan Band and those that include the band is palable. They're stale and obviously lacking something without the band. At that's as a television viewer! Imagine the time and money invested by the folks travelling to the game! But most importantly the players!! If &quot;The Victors&quot; can move a fan to goose bumps and spirited cheering....what does it do for a Michigan football player in the famed winged helmet? What is it they do after every home game victory? Don't they dash for the student section and sing &quot;The Victors&quot; while the band strikes up the most famous fight song ever written? The fiscal argument simply doesn't hold water and I would like to think that DB is above trying to insult our intelligence by arguing differently. The band must go. Why play the game if your not going to have the entire Michigan Football experience? Thu, Apr 19, 2012 : 11:58 p.m. I am ashamed of this decision. I am ashamed of Michigan leadership. Goodwill is difficult to earn and extremely easy to spend. I suspect there are professors at the Ross who can clarify this position should they be asked. I thought more of Mr. Brandon and Ms. Coleman. Both disappoint me now. I suspect that the AD would rather have the funds for the band travel gathered by donors in an outpouring of generosity. Understandable. Indeed, it is quite possible. The band is loved. This decision will reflect poorly on the university at the national stage among friends, fan, alumni, and donors. Fri, Apr 20, 2012 : 2:32 p.m. I'd donate to the &quot;Send the band to 'Bama&quot; cause...AND I'M A SPARTAN!! This is one of the glaring reasons I can't stand U of M...the elitist arrogance and complete disregard for those that make the university relevant...THE STUDENTS!! To U of M: I bite my thumb at you! Thu, Apr 19, 2012 : 11:15 p.m.
the $4.7 million pay day isn't relevant. The $26 million the Athletic Department cleared last year (see previous Ann Arbor.com article: http://www.annarbor.com/sports/um-football/report-says-michigan-athletic-department-turned-a-262-million-profit-in-2010-11-2nd-most-in-the-big/ ) is what its really about. &quot;Its just too expensive. We want to make $27M this year.&quot; This is why I didn't buy tickets this year. Don't support that manta in the least. Thu, Apr 19, 2012 : 10:33 p.m. I understand not wanting to spend a huge a amount of money, but could $4.5 million cover that? Thu, Apr 19, 2012 : 10:31 p.m. Many people will probably comment that this decision seems particularly unfair, given the amount of money the university is being paid for the game. But I'd also note that this is a national platform for the team and university, playing the defending national champions at the start of a new season. Even though most of the halftime show won't be broadcast, in order to make room for ads and talking heads, even one minute of Michigan's band playing &quot;The Victors&quot; on this stage would be worth every penny spent to get them there.